So, has anyone played Halo 4? I managed to get to play multiplayer when I was at a friend's house, and while it was fun, I couldn't see anything too special to actually tempt me to go out and buy it. I had a blast with Halo 3 back in the day, so I sure would like to be persuaded to drop some cash for this, but I can't see anything as of yet to make me do that. Well....it's good, definitely, but while 343i managed to improve the single player, they CoD-nised the multiplayer a bit and generally made it worse. My Halo Reach playtime is a fair way into the four-digit section, while Halo 4 i've only kept playing past the first two weeks because of the weekly Spart Ops episodes. Just not as good imo on that side of things at all. See, the majority of my playtime in Halo 3 came from the multiplayer. Custom games, matchmaking, all of it helped me sink close to 100 hours into that. 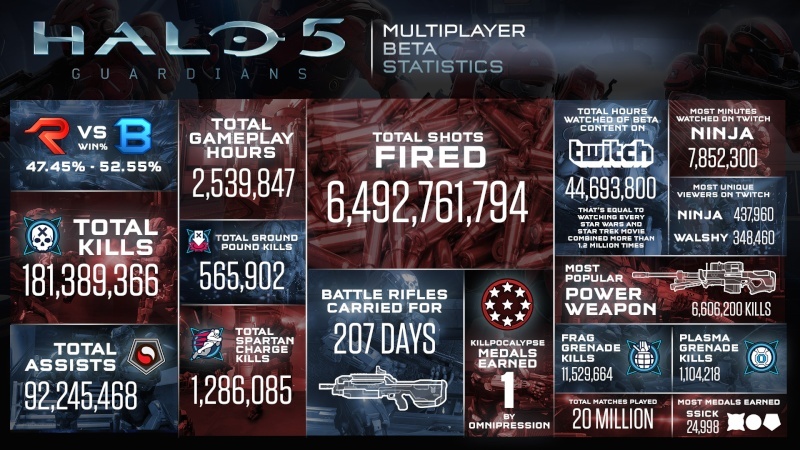 From my brief time spent with Halo 4's multiplayer, I can't see myself spending close to even a tenth of that time with Halo 4. Jay could we change this to general Halo talk especially with 5 being confirmed and the likely hood of 2 Anniversary. Just wondering what everyone's thoughts were on those two games and if either would make you buy a one. So Halo Master Chief collection is real, and is sounding like utter fan-service. Me and a couple of buddies sat and played the first ten chapters of Halo 2 in one sitting last night, with a brief break in the middle for three rounds of Worms. Man, Halo really is fun. The graphics on the anniversary edition are incredible, especially the cutscenes, and the world is well designed if unoriginal. Master Chief is still a badass, Cortana is still full of sass and I actually appreciated the Arbiter plot. At the end of the day though, you don't need a plot with shooting this good. Just the variety of approaches to every situation makes halo so much better than something like COD's campaign. Shotgunning through a crowd of little aliens, swapping to the sniper rifle to take a dude off his hover bike, stealing said bike and using it to get through a fortified location so I can hop in a space ship and take to the air... These weren't scripted, prompted moments this was me deciding on the fly how best to shoot aliens. This is the stuff. I guess I should get on and play a Far Cry game? I've really not clicked with the series yet. I don't find the shooting very fun and I find the levels to be a bit too long and not always with a good sense of direction have only played like 3 missions though. Which game is that, the first one? The design is definitely of a different time, and I can see what you mean about lack of direction. I have found myself getting lost a couple of times but I prefer that to absolute corridor stuff. A little crazy taxi arrow, a la Bioshock, would be good. Or at least a marker on the minimap! I've not played for a while but I though cortana normally puts a arrow up on where to go. Thought it would of clicked with you Andy seeing you like Destiny even with Halo 1 & 2 being rather old now. Glad your enjoying it Drunka, I'm not sure how 3 holds up as that hasn't been touched since 2007 in terms of graphics. 4 apprantly looks decent still though. And guess you can see my excited for Halo 5. I think they've upgraded the lighting engine in 3 but other than that, it was pretty gorgeous already wasn't it? I don't think Halo and Destiny are all that similar personally. I did give it a go but it's shooting didn't click with me on anywhere near the level Halo's did. It was gorgeous but that was 8 years ago, not sure how well its held up but I know lot say 4 looks great still running at 60fps & 1080p. See I found destiny plays like a evolution of halo like how halo evolved from marathon. Definitely Combat Evolved from Bungie, I'm still a little iffy about 343 as I've not heard great things from 5s beta but it's still Halo. So day one buy for me. Yeah it's the first one. I think the more stats based nature of Destiny helps, I like the fact I can see the effect of my bullets on the shields in Destiny whereas with Halo I feel like I'm shooting inaccurate guns into bullet sponges. Destinys headshots are amazing and the guns just feel like a joy to shoot every single time you pull the trigger. Halo is too spray and prayish. As for the maps I like the freedom, but I would like a button to give me something to walk towards. I hate having to wait for the game to get bored of waiting for me to find my way just to see where I'm going. Recently completed Halo:Combat Evolved (as part of the Master Chief Collection), first time I'd actually finished it too. Also completed Halo 3 again in co-op with a mate. Not sure when I'll give Halo 2 another play through and will probably skip Halo 4 because I wasn't a fan of that. Played some of the Halo 5 beta, mixed thoughts on it. Liked some of the changes but also felt it was becoming more like CoD and less like Halo. Playing Halo: CE online multiplayer (and Halo 3) made the beta look worse as those two had it near enough perfected. I'd never played a halo for more than a quick go on multiplayer before I picked up the MCC but after Combat Evolved and Halo 2, im absolutely loving it. Halo has always been a local multiplayer game to me. I've never got into it so was pretty chuffed when MCCollection was announced. Really need to give it more time but I'm clearly missing something. I don't think you will Andy as you've played the level Silent Cartographer right, which is is epic and what Halo is about. Yeah that what I was hearing about 5 Lemon, it plays more like COD in MP but SP you hope will stay be great. Think that might be my next mission, I'll push through but it sounds like it'll be 4&5 that'll be most up my street. Yeah try Silent Cartographer id that doesn't click then I don't think the bungie made ones will, maybe ODST as it plays different as your just a ODST not a Spartan. 4 wasn't very good 343 played way to safe but from what I'm hearing about 5 there now doing what they want more which is make HACOD. Single player wise ODST is probably my favourite Halo game. With all this Halo talk I was looking at XBONE's in GAME, kinda tempted at £350 for a white consoles with sunset & forza we rushed out for launch buy the rest of it with dlc 5 both digital versions and I could pick HaloMCC if I wish as a 3rd game. It's not a bad deal but I've played Forza 5 and Sunset doesn't interest me that much, but that lot worked out cheaper then there other deals plus halo. This is coming earlier then I thought with Oct 27th which makes me feel Rise of the Tomb Raider is November. I have tried pretty much every Halo game made, wanting to like it and never actually achieving it. It isn't just because it is a FPS, which isn't my thing, but because I found it all gosh darn generic. The closest I got to liking Halo was Wars, which really isn't Halo except in name. Now that I have made a decision to never own an Xbox One, I have removed any chance of even trying Halo again. See I will buy a ONE (again) just for Halo 5 even with the negatives from the MP BETA that it plays like COD which is generic. But Halo certainly isn't, if you don't like Halo then I wouldn't bother with another FPS again as it's the daddy of the genre. Picked this up anyone playing it still online (if it works).